In an exclusive interview, Sputnik has spoken to new Zimbabwean President Emmerson Mnangagwa about the situation in his country after Robert Mugabe's impeachment, as well as relations with other states. Sputnik: This is the first time the leader of Zimbabwe comes to the WEF in Davos. Could you please tell us why you decided to come and what your objectives are? A: The invitation came 3 weeks ago. I think the interest wasn't particularly mine, the interest rose from Davos itself. They invited me to come to Davos to present the new order, the new disposition taking place in Zimbabwe and to be able to meet global leaders in international trade, investment and so on. I felt that's an opportunity for me to showcase the case of Zimbabwe going forward. Sputnik: You obviously want to attract foreign investment in your country through participation in this Forum. In which spheres foreign investors could be interested in Zimbabwe? A: Zimbabwe is a developing country, it is a developing economy. Zimbabwe has been isolated for the last two decades and so on. We are kind of behind in terms of economic development for that period of 16-18 years. Primarily our economy is agricultural which means that the area we would like to modernize is agriculture. We want to mechanize agriculture, modernize agriculture at the production level. We would like to see investors who want to participate at that level of production. Then — at the second level, where the products of the agriculture have to be processed, value-addition of these products, and then marketing. So an investor can choose to come to the marketing level or to the value-addition level or to the production level. For instance, let me give you an example of cotton or tobacco. You may want to come and participate in the production of tobacco in the raising facility, you may want to come on the level of processing tobacco, you may want to come on the level of marketing and trading of tobacco. Or let's take cotton. Currently, we have nearly 450,000 metric tons of cotton produced, but only have the capacity to utilize about 30% of that amount. The rest of that cotton is exported raw to the rest of the international community. But you may want to come into Zimbabwe and then join the next level where you process cotton into clothing. That is value chain you may want to come and participate. That is the area of agriculture. Also, in the area of mechanization. Currently, we have a protocol with Spain, Brazil and Belarus where we try to mechanize our agriculture by importing pivots for irrigation as well as machinery to create more dams in Zimbabwe so that when there is drought we still have enough water to produce enough grain for the country. So when there is drought or no drought we still must have a model of agriculture that gives us enough grain for ourselves, possibly also the surplus. So that is the area we say please come in. Then the second one is mining. Zimbabwe has numerous minerals. In fact, the question should be what we don't have and not what we have. You may have people to come in to engage in mining, but we are having the issue of indigenization, where it is required that those who come into those extractive or depletable resources have to come at the sharing level of 51% domestic, 49% foreign as the investor. But now we have said that this sharing issue can only now relate to 2 minerals that are diamonds and platinum. Just because we don't have now a concrete policy for diamond industry as well as for platinum industry. Now we still will keep these 2 minerals requiring 51% domestic, 49% foreign. But the rest of the other minerals, like gold, coal, chrome, nickel, lithium, whatever, it is free. Foreign investors can come and negotiate whatever they want to depend on whom they are a partner with in the country, it is open. That is an area where we believe that we can also grow our economy through the exploitation of our domestic minerals in that area. Sputnik: Do you see Russia as a principal investor in that area? A: We have Russian companies in 2 areas. We have one Russian company which came some years back in gold mining. Initially, they came in for gold mining but they spread their wings into diamonds. Then we have another Russian partnership with the government of Zimbabwe in platinum. Those are 2 areas where Russian companies are involved. But with the new disposition, we are opening up. We are not restricting Russian companies to these two. It is open across the board, they can go into infrastructure development, construction of railways, highways, that is open again. In tourism, they can come, it is open. This is why our slogan in Zimbabwe now is "Zimbabwe is open for business." As a government, we have to make sure that we create an environment where business can thrive, and make sure we look at the legislation in the country to make it easy for making business in Zimbabwe. Sputnik: Turning to the political situation. In May or June, you are going to have presidential elections. How do you feel about it? Are you certain about the popular support? A: I am not so sure we are talking about May or June, but it is soon. Zimbabwe is very stable in terms of politics. There is political stability. I am sure you're aware this political stability took place 2 months ago, less than 2 months ago, it was a people-driven transformation, very peaceful. I don't think it can happen anywhere except in Zimbabwe because our people are united, our people know what they want. During that period of 8-9 days of transformation in the country, hundreds and hundreds of thousands of people marched in the streets of Harare also in other towns outside Harare. But not a single incident of damage, not a single shop was damaged. In fact, crime during that period went down which meant all our people were focused in demanding change. And ZANU-PF party, we are best as a party on trying to meet the needs of our people. Our people had spoken that they want a change. So our president responded to that call and he stepped down. And then the people, the ruling party ZANU-PF, nominated me to lead them, and later on, we went to Congress, where I was elected the president of the party. Yes, I will go for elections in the few months' time, and we'll indicate when. In terms of the constitution, every five years we have to surrender ourselves to a new mandate, and we are not going to forget, we will continue to obey the constitution. We want to entrench constitutionalism in our system, so we will make sure that in a few months' time when we proclaim election, the country is very peaceful. And the country is expecting these elections. And I have no doubt of sweeping the elections, of winning the elections. You are invited if you want to see. Sputnik: And what about the foreign observers, are you going to invite them? A: Well, countries like Russia have been on our side, during the times when Zimbabwe was under sanctions by the West, Russia stood with us. So, yes, we have an embassy in Zimbabwe. In terms of our law, every embassy is allowed to have five people from the embassy to observe the elections. But above that, I'll be willing to have Russian observers to come and observe our elections. Sputnik: Do you expect to have more support from Russia in future, after elections? A: When I've got inaugurated, the three leaders who sent me congratulations and sent me their envoys on the first day, were Xi Jinping, of China, President Putin, of Russia, and surprisingly May, Theresa May. They three sent their envoys and messages, within the first 24 hours. Sputnik: Do you have any arrangements for meeting with Russian officials soon? A: No, there are no arrangements. But I have my vice-president who is likely to travel to Russia. Those arrangements are underway now. Sputnik: When will this be? A: As I have said, I have arrangements now, and I want to send one of my vice-presidents to travel to Moscow. Soon. Sputnik: Do you expect any new contacts with Russia in buying arms, defense systems? A: We have always had very amicable relations in that area of defense and security with Russia. We have historical relations in the area of defense and security. This will not only continue, but it will also be consolidated and deepened. Sputnik: Talking about the relations with the EU. There were sanctions of the European Union against Zimbabwe, and they want to see a plan of economic reforms in the country. So, do you have this plan, do you have a clear strategy how you want to proceed with economic reforms? A: No. When we are looking at how we should grow economy, we should cooperate with the international world. We are not focusing on what the EU wants. We are focusing on what is good for Zimbabwe, for our country. A national interest comes first. In that process, if what they want us to achieve is democratic and in the purview of the framework of our own desires and national interests, then we're together. Sputnik: And do you have in mind some clear strategy for political and economic reforms after the election? Will Justice Finally Be Served for Ethiopia’s Mengistu After Mugabe's Ouster? A: What reforms?.. Everyone who turns the age of 18, is allowed to vote, so I don't want us to reduce it to 16. Currently, everyone turns 18 is allowed to vote in my country. And political partisans are not even required to register when they form themselves in political parties. They just form, and only when there is a general election, then they are going to register for participating in the general election. So, in terms of political democracy, anybody can participate, anybody can form a political party, anybody can contest. So, that's the environment and the atmosphere. Sputnik: So you are satisfied with it, you believe that the level of democracy is pretty high in the country, right? A: I'd like to see someone who points a finger to our constitution and says: your constitution is not adequate in terms of providing democracy in modern times. Currently, we think it satisfies the needs, free movement of persons, free speech, free association, free press, those things are all there, in our constitution. 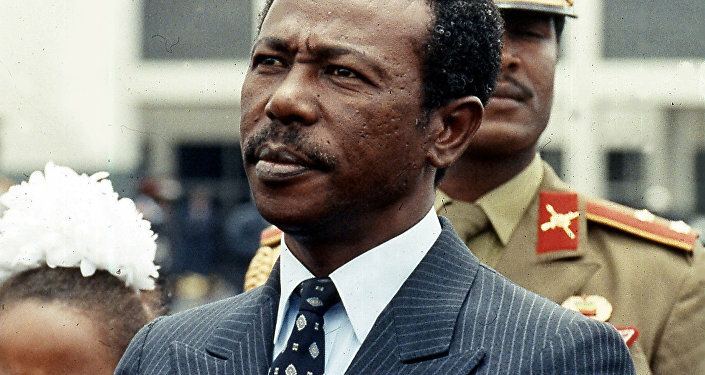 READ MORE: Will Justice Finally Be Served for Ethiopia's Mengistu After Mugabe's Ouster? Sputnik: And summarizing the political situation in your country now, in your opinion, what was the main mistake of the previous leadership, of president Mugabe, which you would not like to repeat? A: No, the president never made any mistakes. There was a small cabal of individuals in the relationship around the first lady. Because the president is now quite advanced in age, they took advantage of his age, and we were having persons who were making executive decisions, which is against the constitution of the country. And our people reacted to people usurping power, which is not given to them by the constitution, so this was corrected by the masses of Zimbabwe. A: With the new disposition, the new order, one of the primary issues that we've put forward is that we need zero corruption, we will not tolerate any corruption at all. I'm now about 54 days in power, and so many people now have been taken to court on the case of corruption. So it's one of the things that we want to eradicate in our society, we want to have a clean society. People must work hard to earn their living, and we must provide those of talent, we must have the environment where people who have talent must be rewarded and become rich if they can, but properly and honestly. Q: In March, we are also going to have a presidential election in Russia, and current president Vladimir Putin has already declared that he is going to run for the presidency again. What do you think about it? A: It's nice. I would be very happy if he succeeds, because president Putin is cooperating with us exceedingly well.